St Joseph’s College consistently achieves strong results in the Higher School Certificate across a wide range of subjects. This ongoing success reflects the College’s commitment to providing a balanced and well-rounded education for students. Since 2009, 26 students have been named in the Top Achiever’s in Course list, with four students achieving first place in a course. Many Joeys graduates gain entry to highly demanding university courses, including medicine, law and veterinary science, based on their HSC results. Each year a number of students are awarded tertiary scholarships to institutions across Australia. One of the greatest achievements of St Joseph’s College is that boys excel across a very wide range of subject areas in the state-wide examinations. This reflects the College’s success in providing students with a balanced and well-rounded education. “Love what you do, choose to be positive and make a difference”. These 2018 HSC results are the fulfilment of the advice that was so beautifully delivered by Mrs Gail Kelly, former Westpac CEO, at the Academic Prize Giving Evening held at the start of the year. The Class of 2018 were generous of spirit and energetic in their pursuit of academic excellence. Indeed, their collaborative and engaged approach to learning exemplify the Marist values of family spirit and love of work, in congruence with Mrs Kelly’s life maxim. The fine HSC outcomes also shine the spotlight on the leveraging of individual strengths, with diverse achievements ranging from State rankings in Latin Extension, Studies of Religion 2 and Modern History, through to multiple nominations and selections for exhibitions in the creative arts and technology subjects. David Mulherin attained ATARs above 99. An impressive seven students were acknowledged in the All Rounders’ List, scoring the highest band result in 10 or more units. These students include: Aston Buffier, William Burton, Luke Dolin, Oliver Duffy, Gabriel McLachlan, David Mulherin and Thomas Ryan. Four students were named in the Top Achievers’ list, with State placements for Luke Dolin (3rd Place Latin Extension), Connor Lovely (7th Place Modern History), John Salvaris (3rd Place Studies of Religion 2) and Douglas Stuart-Brookes (9th Place Studies of Religion 2). A significant 17.50% of all HSC results were Band 6 (90 or above in a 2-unit subject) or E4 (45 or above out of 50 in an Extension subject), represented by 202 entries. 26% of eligible students received an ATAR above 90, with approximately 13% above 95. Significant gains were made by students at a range of achievement levels, with 87% of the examination results Band 4 or above. In Ancient History, students scored an incredible 12.79 marks above the State HSC Examination Average and 46% of students attained a Band 6. Similarly, in Modern History, the HSC Examination average was 9.40 marks above the State Average, with 29% of candidates recording a Band 6. In Studies of Religion I, 21% of the results were Band 6 entries, almost 3 times the State Average percentage, and 20% of Studies of Religion 2 students attained a Band 6. The 98-strong cohort in Mathematics General 2 attained an HSC Examination Average 8.61 marks above the State Average. Whilst, in Mathematics 2 unit, 41% of candidates attained a Band 6 result, including the vast majority of the Year 11 Accelerated class. In the demanding Science discipline of Physics, 29% recorded Band 6 results and performed 9.34 marks above the overall State Examination Average. This 29% figure was matched by Chemistry students, which was 3 times the State Average Band 6 entries. In the cut and thrust of Legal Studies, 33% of students produced top band outcomes, with an equally impressive HSC Examination Average of 7.93 marks above the State. An outstanding achievement in the creative arts, with 5 of the 7 Music I students attaining Band 6 results and 2 out of 3 performing in the highest band for both Music 2 and Music Extension. Ananya Bhindi, Angus McDonald and Harry Rice-Rickman were nominated for ENCORE, a selection of performances and compositions from HSC Music students. In Drama, similar outcomes were attained, with 4 out of the 7 students performing to the Band 6 standard. In Industrial Technology, comprising the strands of Multimedia, Timber and Metal, the average HSC Examination Mark was 8.34 above the State Average. The following students were nominated for InTech, the annual exhibition of outstanding Major Projects developed by HSC Industrial Technology students: Charles Davis, Thomas Eveleigh, Tobias McGrath, Hugh O’Leary, Thomas Quinn and Jake Sevil. Benjamin Sevil was nominated and selected for InTech 2019. Tahi Fiu was nominated for Shape, the annual exhibition of a selection of exemplary Major Projects developed by HSC Design and Technology students. In Visual Arts, 33% of students produced Band 6 performances, expertly balancing the written and practical components. The varied contributions of Ethan Cutler, Oliver O’Kane, Campbell Orton and Jet Williams yielded nominations for Art Express, while Angus Bick, Thomas Hewson, Kai Jadwat and Nicholas Radford were selected for exhibition in 2019. Subjects where 100% of students achieved Bands 5 or 6 include: English Extension 1, English Extension 2, French Extension, Japanese Extension, Latin Extension, Mathematics Extension 2, Music 1, Music 2, and Music Extension. The HSC outcomes, for the class of 2018, rather than signalling an end point for students, represent the beginning of the next stage of learning in how to “make a difference” in the lives of others in the wider community. Whilst many fine educators played a role in these achievements, over many years, significant gratitude must be extended to the educational leaders and HSC teachers for 2018. Their leadership and expertise helped form purposeful partnerships with students and their families, a working alliance that will undoubtedly have enduring impacts. St Joseph’s College has a proud history of striving for academic excellence, a principle embedded in the College prayer ± in meliora contende or strive for better things. The class of 2017 have taken up this quest in producing a fine set of HSC results, representing a core component of their varied and collective achievements. In true Marist tradition, these successes were realised with humility and a love of hard work. Thomas McGregor was Dux of the College with an ATAR of 99.95 (maximum possible ATAR). A record 9 students were acknowledged in the All-Rounder’s List, scoring a Band 6 (90 or above) or E4 (45 or more) in 10 or more units. 3 students were named in the Top Achievers list, with State rankings by Finnegan Waugh in Chinese Beginners (1st in State), alongside Thomas McGregor and Thomas O’Sullivan in Studies of Religion 2-Unit (2nd and 4th respectively). An impressive 19.1% of all HSC results achieved were Band 6/E4, represented by 215 entries in this top band of achievement. The College improved their SMH State Ranking by 11 places in 2017. Impressive gains were made by students at a range of achievement levels, with 89% of the examination results Band 4 or above. In Studies of Religion 2-Unit, 28% of the results were Band 6 entries, 4 times the State Average percentage. The Visual Arts Department, working collaboratively with students, achieved Band 6 entries for 54% of their students. 8 students were nominated for ArtExpress, with 3 being selected for display. In Advanced Mathematics (2-Unit), 46% of the 74 students attained a Band 6 result. In Modern History, almost 1 in 4 students achieved a Band 6 outcome (23%), approximately 3 times the State Average. 4 students were nominated for Shape (InTech) Design, including 2 from Design and Technology and 2 from Industrial Technology – Metal. Lucas Riebolge was selected for display in 2018. A notable 28 students (40%) in the Extension courses achieved an E4 (top band) outcome. Subjects where 100% of students achieved Bands 5-6 included: English Extension 1, English Extension 2, French Continuers, French Extension, Japanese Extension, Latin Continuers Latin Extension, Mathematics Extension 2 and Music 2. 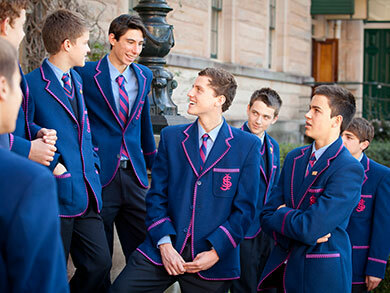 The collective striving for excellence is a key feature of the academic journey at St Joseph’s College. Indeed, this collaboration is highlighted by hard working staff and students working side by side throughout the extended school day and, on many occasions, during evening study and weekends. The HSC results, for the class of 2017, were a culmination of this team approach, as a springboard to the next stage of their (lifelong) learning. St Joseph’s College celebrated strong HSC results for 2016. There were a number of outstanding individual and group achievements, including one student achieving first place in the state in Mathematics 2 Unit and two more students placing in the top 20 in the state in a subject. Seven students were named on the HSC All Rounders List for achieving in the top band in 10 or more of their units. The dux of the College for 2016 was Tarkan Gursel with an ATAR of 99.10. In total, 189 students from St Joseph’s College were eligible for ATARs. To the best of the College’s knowledge, ten per cent of SJC students achieved ATARs above 95 and one-quarter of the cohort achieved ATARs above 90. Approximately half the cohort scored ATARs of 80 or higher, whilst more than 70 per cent of students achieved ATARs above 70. A total of 194 Year 12 students from St Joseph’s College sat the HSC examinations, along with 13 Year 11 students studying accelerated mathematics and two Year 11 students studying accelerated French Continuers. Almost two thirds of all exam results were in the top two bands (above 80%) and more than 90% of all exam results were above 70%. In Mathematics Extension 2, Music 1, and French Continuers all students from St Joseph’s College achieved marks greater than 80%. Exceptionally strong results were achieved in Information Processes and Technology, which scored 15.18% above the state exam mean, Industrial Technology with 14.53% above the state exam mean and all students scoring in the top two bands. Mathematics General 2 was 12.42% above the state mean an Ancient History with 10.28% above the state mean. Other subjects scoring notably higher than the state exam mean were French Continuers (+9.29%), Music 1 (+9.12%), Studies of Religion 2-unit (+8.66%), Mathematics (+8.35%) and Legal Studies (+8.25%). The College recorded 184 entries from 85 individual students on the Distinguished Achievers List for achieving in the top band in a subject. Mathematics recorded 22 entries on the list, Studies of Religion 1-unit recorded 20 entries and Mathematics General 2 recorded 18 entries. The College continued its strong reputation for excellence in Visual Arts, with an incredible 12 students nominated for ARTEXPRESS and five selected for the exhibition. One student was successful in being selected for OnSTAGE and three students were nominated for InTech. A large number of outstanding individual achievements led strong HSC results for the St Joseph’s College’s Class of 2015. Six students, across seven subjects, achieved in the top 20 in the state in a course, whilst six students were named on the HSC All Rounder’s List for achieving in the top band in 10 or more units. The College recorded 191 entries on the Distinguished Achievers List for students who scored 90% or more in a subject. A total of 207 students from St Joseph’s sat for the HSC examinations in 2015, along with 14 Accelerated Mathematics students from Year 11. The College’s examination mean was above the state mean in 32 of the 37 courses studied (86.5%). Music 1 and Ancient History achieved very strong results, with both subjects scoring examination means more than 10% above the state exam mean. Other high achieving courses were Visual Arts (9.82% above state exam mean), Senior Science (9.35% above), Mathematics General 2 (9.22% above) French Continuers (8.92%) English Extension 2 (8.46% above), Modern History (8.28% above), Mathematics Extension 2 (7.44% above) Industrial Technology (6.82% above), Physics (6.33% above) and Geography (6.24% above). All students in English Extension 1, English Extension 2, French Continuers, French Extension, Latin Continuers, Latin Extension, Mathematics Extension 2, Music 1 and Visual Arts scored examination marks above 80% (Bands 5 and 6), well in excess of the state average for achieving in Bands 5 and 6 these courses. Studies of Religion 1 Unit received 25 mentions on the Distinguished Achievers List, Mathematics received 20, English Advanced received 15, Mathematics Extension 1 and Mathematics General 2 each received 13, Visual Arts and Modern History each received 10, English Extension 1, Music 1, Business Studies, Ancient History and Studies of Religion 1 2 Unit each received seven mentions on the list. Five students were nominated for ARTEXPRESS, with three students selected for the exhibition. One student was nominated for Encore and one student was nominated for DesignTECH. Remarkably, Oliver Sumsky was nominated for both ARTEXPRESS (and selected for exhibition) and Encore.